Is there anything better than mashed potatoes? Only when you put them back in the oven for a second baking. 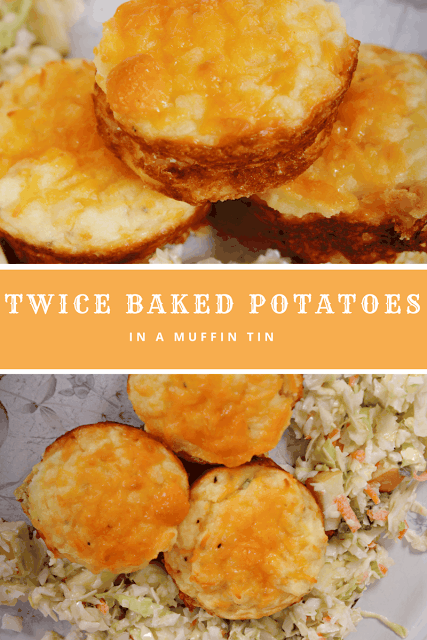 I love twice baked potatoes, the are creamy and full of flavor. 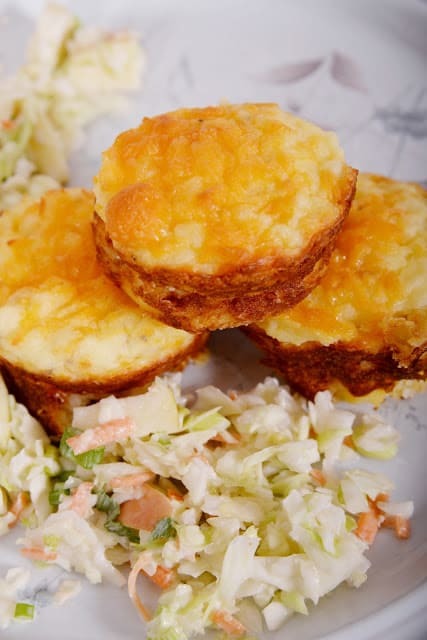 I have always wished for a crispier twice baked potato and when we started making lasagna in muffin tins, we used the same technique for these and they have perfect crispy edges and a cheesy top. The best part about these is that you can customize them to your family. If you like sour cream, bacon and green onions on your baked potatoes, put them in your twice baked potatoes, if there is something you don’t like, just leave it out. Combine all of the ingredients on the list. You can add or take away things depending on your potato preference. Add some cheese in the mixture and save some for sprinkling on top. 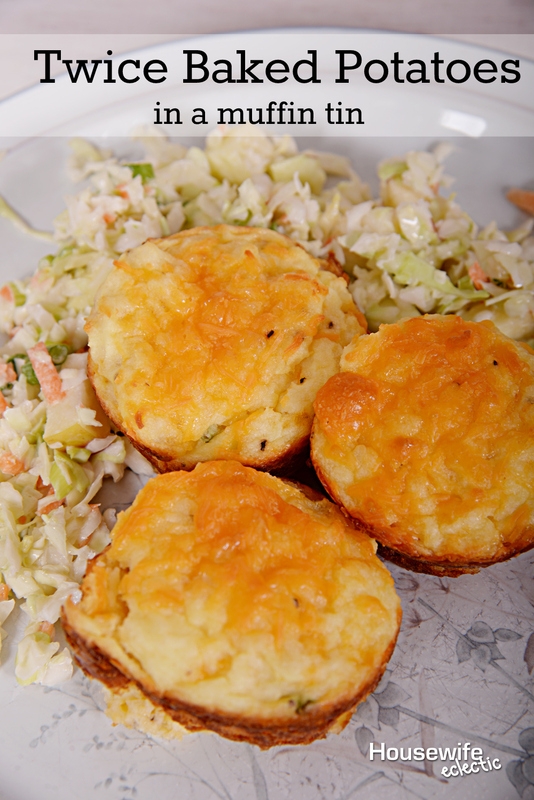 When everything is well combine, grease a muffin tin well and then fill each cup of the muffin tin with the potatoes. Top with a pinch of cheese on each potato. Bake the potatoes at 400 degree for 30-45 minutes until they are brown and crispy. What do you like in your potatoes? Those sound so good. I think these would make a nice side dish for pretty much any meal. Those sound and look so good. I am imagining them with a juicy steak. I love good potato dishes! Don't you just love food you can make in a muffin tin? These look very kid friendly! I was just telling my husband that I wanted some twice baked potatoes and these would take care of that craving. They look delicious. I was just telling my husband I was in the mood for twice baked potatos. These sound like they will fit the bill. 🙂 Thanks. Love these. We're big potato fans in our house and always looking for new recipes. OMG these look so tastey! My family loves their potatoes so I know these would be a huge hit in our home. This sounds absolutely amazing!!! I never thought to make it in a muffin tin! Oh man I can smell these through the computer! Making these ASAP!!! Isn't is amazing how many different things you can make in a muffin tin. Great for on the go eats. My husband was just eyeing some twice baked potatoes at the store. These homemade ones will be much better. I love that they are individual servings as well. I made these after seeing your pin on Wednesday…. Brilliant! I love the individual portions and was able to cater to all of my picky eaters! I loved the crunchy edges! They will definitely be in our house on a regular basis! This looks awesome! I don't know why I never think to make these because I love them so much. And I love the individual portionsns!! Now this is smart! I know that the kids would eat those potatoes..especially because they are in individual sizes. Perfect for a bbq with friends too… that way you will always have enough! These look super tasty, and I love that they are individual portions. How very clever! These look delicious! I will have to try them out the next time we have leftover mashed potatoes! Oh man, I love this! And so much easier than trying to scoop out the potatoes without breaking the skin…can't wait to give it a try! Perfect idea to bake mashed potato! I'll try it to cook with greens. I can imagine this wonderful flavor. What an awesome idea! I love making mini foods and always have leftover mashed potatoes! Will make this for sure. Nice use of leftovers! Thanks for sharing at Merry Monday. We'd enjoy this at our table. Oh my goodness, yum! I love twice baked potatoes but these make it a much easier meal to eat! Thanks for linking up with delicious dishes recipe party!